Can Johnny Mac schedule a fashion counseling session with BYU’s Jimmer Fredette – and the rest of college basketball, for that matter? 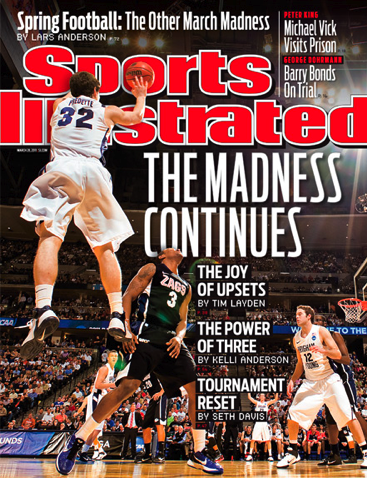 We, too, are obsessed with the leaping ability of SI cover boy Jimmer, but could do without the past-my-knees shorts that make him (and all players) look like they’re still 13 and playing alley ball. C’mon, fellas. More: Serena was shot for the cover of Harper’s Bazaar for their August issue, due out July 20th. with a wife like her, who needs grand slam titles? As we wrote about earlier, Venus Williams will be participating in the BNP Paribas Showdon at MSG next month, vying for $1.2 million in prize money to be split among her, sister Serena, and Serbians Ana Ivanovic and Jelena Jankovic. “I’m hoping for an all-Williams final,” she told the press today. She’s also looking forward to playing at the storied tennis venue for the first time since the 1999 WTA year-ending championships. In light of tennis’ contribution in this year’s SI swimsuit issue, TSF asked Venus about her own experience posing for the magazine, back in 2005. 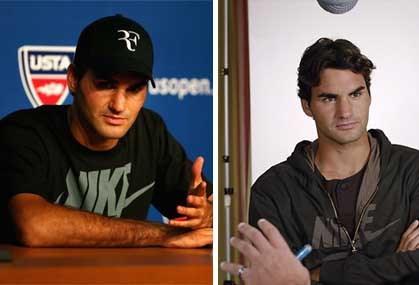 Serena posed in 2003 and 2004. Even so, gallivanting in the sand sounds like a lot of fun. Would she consider giving it another shot? And Venus will soon fly to Dubai and participate in the Barclays tourney. The American No. 2 (second only to her sister) gave us a small taste of what to expect from her EleVen outfits for the upcoming tennis season. She’ll wear more prints, perhaps taking another cue from Serena, who did the same for the Australian Open in January. Browse: See Venus’ SI pics here. More info: The BNP Paribas Showdown, March 2, 2009 at Madison Square Garden in New York City. Tickets ranging from $1,000 to $50 available at ticketmaster.com. The event will be shown live on HBO (7:30 p.m. ET/4:30 p.m. PT) and will be called by Mary Carillo, Billie Jean King, and John McEnroe. This marks the first time since 1999 that the premium channel has broadcast a tennis event; they carried Wimbledon from 1975-1999. While they might not have any major titles among them (one or two Tier I’s, at most), the blonde tennis trifecta of Maria Kirilenko, Dani Hantuchova, and Tatiana Golovin has the distinction of being included in Sports Illustrated‘s 2009 Swimsuit Issue. They’ll join Andy Roddick‘s fiancee Brooklyn Decker, along with a long list of scantily clad babes. A sneak peek of the issue aired on CBS Sunday Morning (who was the target demo? ), spun as a profile on legendary photographer Walter Iooss, who shot the trio for the magazine. And on tonight’s episode of the Late Show with David Letterman, the magazine will announce the cover girl. And now: an unnamed deputy prime minister and his family are so fricking lucky. This unnamed minister had lunch with Nadal and Gasquet. His daughter was sitting NEXT TO GASQUET and discovered he was a shy guy. And Nadal said to her that they had never received such a warm welcome and reception anywhere before! The aforementioned daughter also says that Mirka, the ubiquitous fiance of one Mr. Federer is such a nice lady and they EXCHANGED E-MAILS. 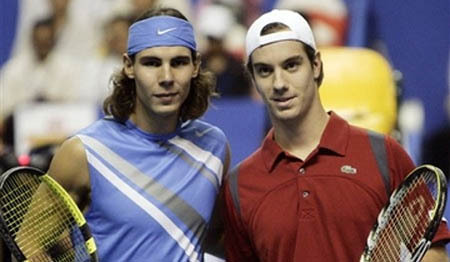 Oh, and here’s the biggie: the son of this minister PLAYED WITH FEDERER. He helped Federer warm up for his match and stroked with him. Oh! I only know this because my coach is the coach of said son and daughter. Is Roger SI worthy? 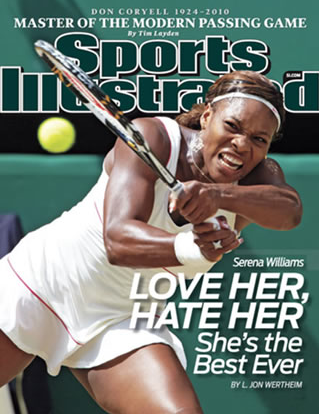 : Journalist (and biographer) Rene Stauffer makes a case for Sports Illustrated to award Roger their “Sportsman of the Year” award. If SI had a worldwide circulation, all of Roger’s feats and records add up. But with the magazine’s readership mainly American, the award’ll probably go to someone like Tom Brady, no? Roger films UNICEF ad: The World No. 1 continues his philanthropic ways by appearing in a PSA (in Real Audio here) to raise awareness about mother-to-child HIV transmission for UNICEF. (DTL) Other celebs attached to the campaign are Susan Sarandon, Shakira, and David Beckham. UNICEF filmed Roger’s PSA during the 2007 U.S. Open.